Bathtubs, Whirlpools, Spas, Bathroom and Kitchen Sinks and Accessories. Duravit Bath and Kitchen Faucets and Fixtures for Luxury Kitchens and Bathrooms. An industry leader for innovative design and the highest quality since 1817, Duravit aims to offer their customers products designed to fit a wide variety of different tastes. After being celebrated internationally with design awards Duravit has become a master of discovering user needs and preferences and designing products to overjoy the customer in their search for the perfect bathroom and kitchen design. 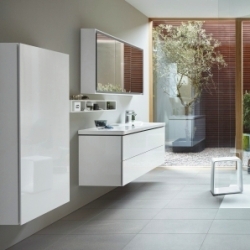 Duravit has an eco-conscious product line, unique modern styling, strong product guarantee and a huge selection. The Duravit company will make a great addition to your bathroom or kitchen. Duravit's baths and whirlpools offer you not only an exhilarating experience in the bath, but highly agreeable after effects too: The air bubbles stimulate circulation, while the water massage promotes the flow of blood through the body. Duravit kitchen sinks are just what the modern kitchen ordered! Meant to be a focal point of the room, Duravit kitchen sinks incorporate classic porcelain in unique square and rectangular shapes for a modern design that is sure to captivate.